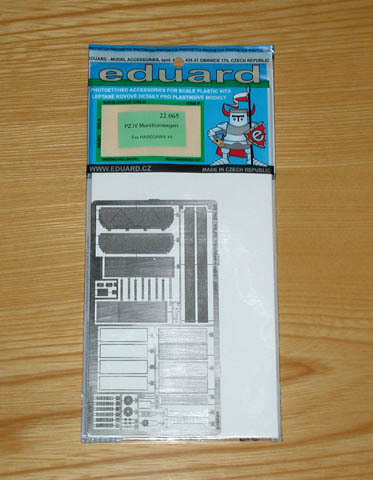 Eduard is the third company to produce PE sets for Dragon's 1/35 kits, after Lion Roar and Part. 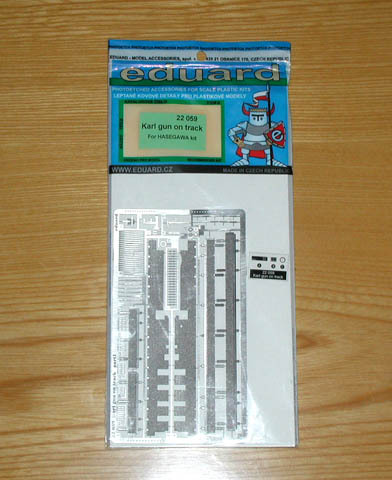 Eduard produces as many as six sets; three for 60 cm gun kits (6179, 6179X) and another three for the 54 cm gun kit (6181). 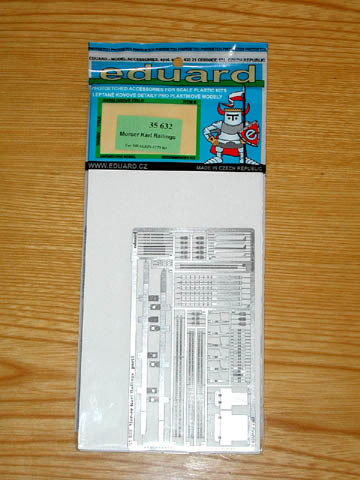 When compared with Lion Roar's and PART's, Eduard's sets have more parts than the others. 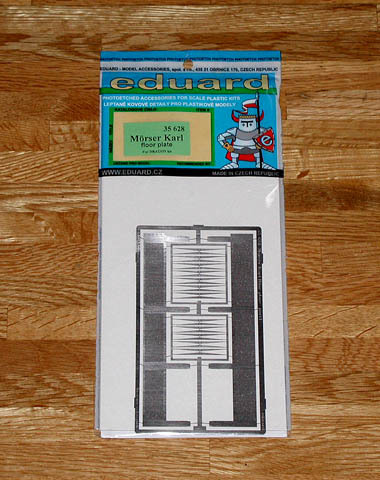 However, it does not necessarily means Eduard's sets includes all the parts Lion Roar and PART can offer. 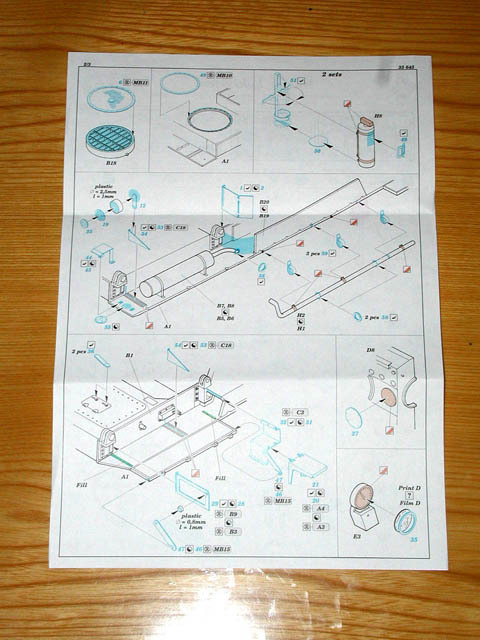 Depending on which part of Dragon's kits you would like to update, you may find PART's set sufficient. 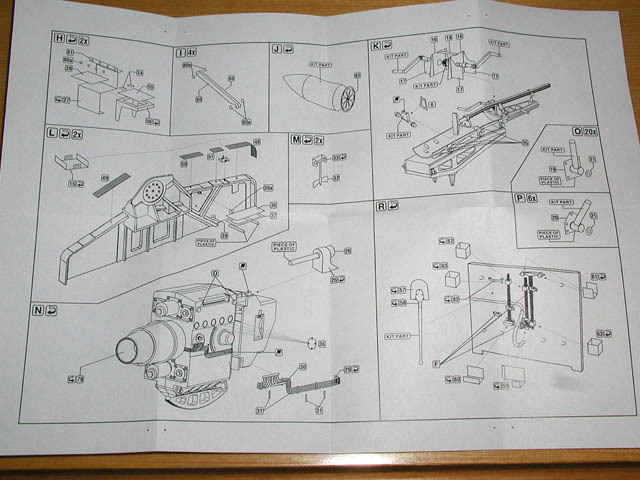 This PE set updates the main part of 60 cm gun kits (6179, 6179X). 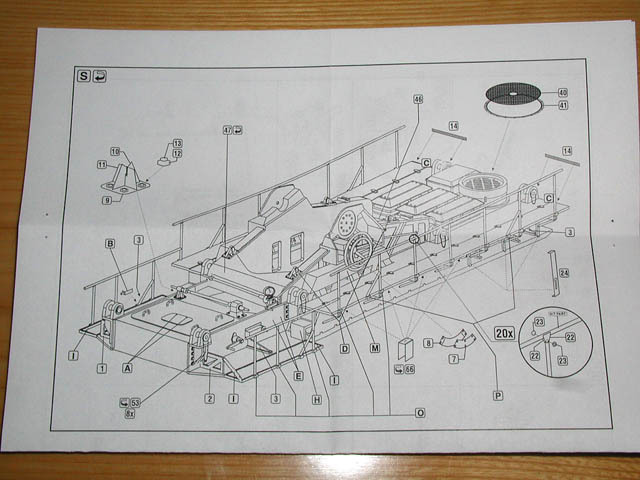 It includes tool clamps, details in driver's compartment, the instrument panel, handles, chains, fender supports, light guard, bottom details for the shell, and many others. 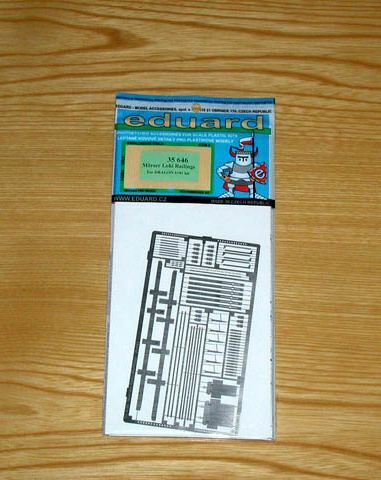 Although this set is intended for the 60 cm gun kits, it can also be used for the 54 cm gun kit (6181), However, as the kit 6181 already has several PE parts, some parts in this set may be redundant. This PE set updates foldable floors in Dragon's 60 cm gun kits (6179, 6179X). As an added bonus, it has a PE plate with small holes to produce rivets out of heated spurs. 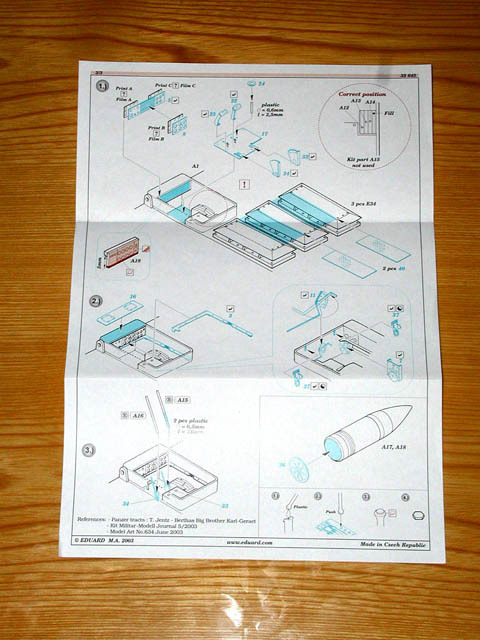 Although this set is intended for the 60 cm gun kits, it can also be used for the 54 cm gun kit (6181), as there is no difference between the two kits regarding the foldable floors. A detail-up set for foldable railings in Dragon's 60 cm gun kits (6179, 6179X). 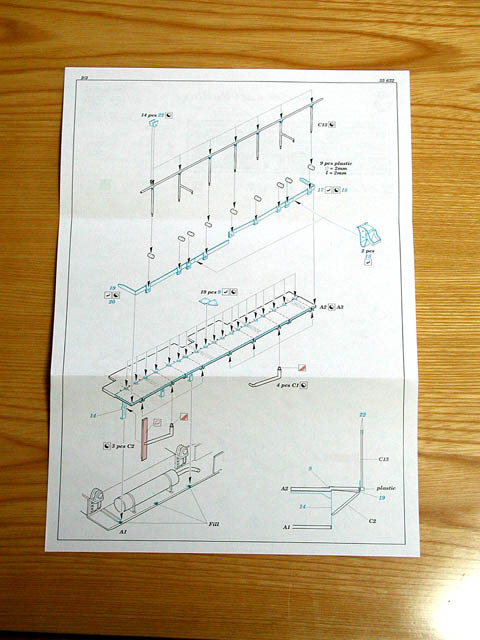 It includes hinges, rivets, base of railings, and fastening belts for railings. 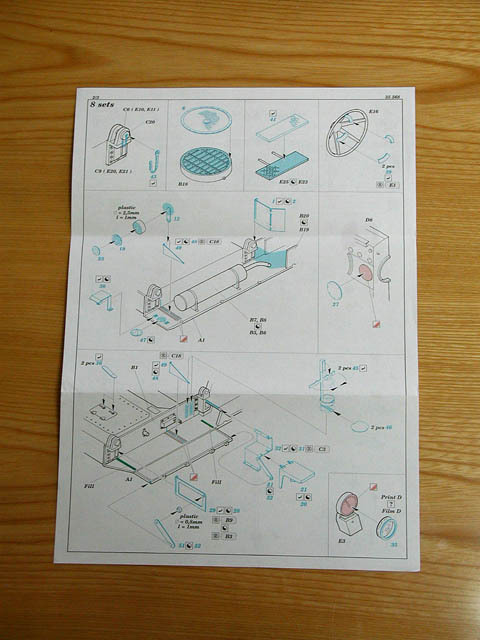 Although this set is intended for the 60 cm gun kits, it can also be used for the 54 cm gun kit (6181), as there is no difference between the two kits regarding railing parts. 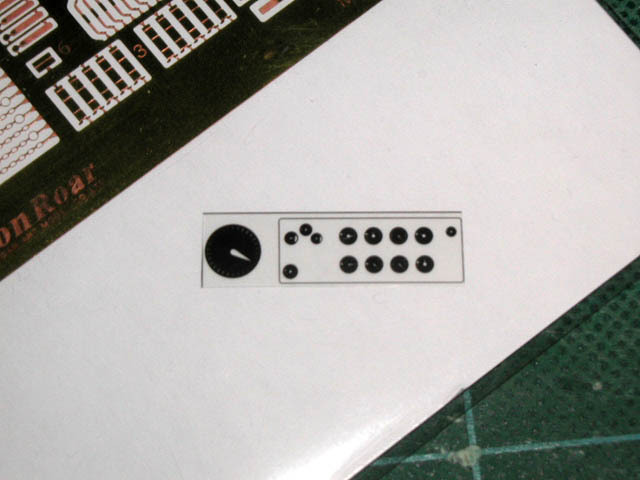 The PE set from PART also includes similar parts. 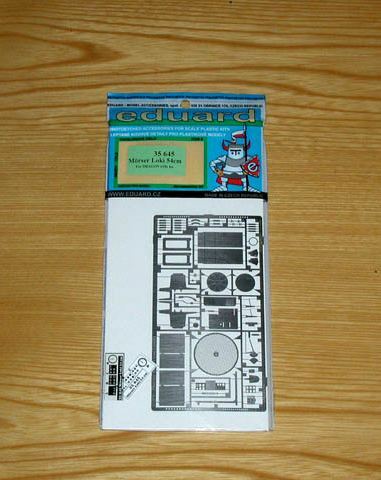 But, this Eduard's set has more parts and details. 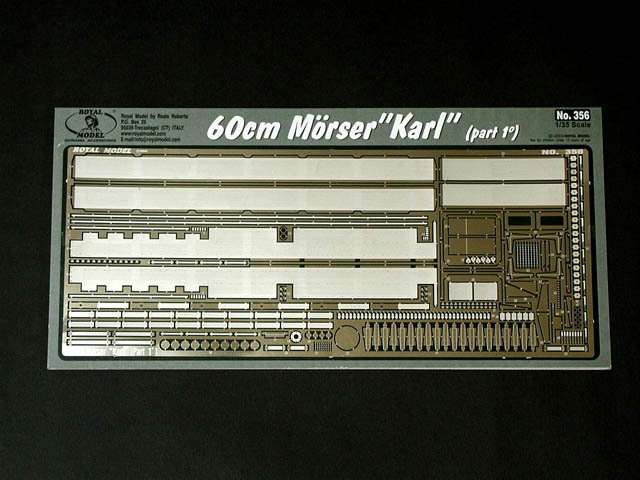 This set is for Dragon's 54 cm gun Karl (Geraet 041) kit (6181), and is basically the same as the set "35568 Moerser Karl 60cm" for the 60 cm gun Karl kits (6179, 6179X). 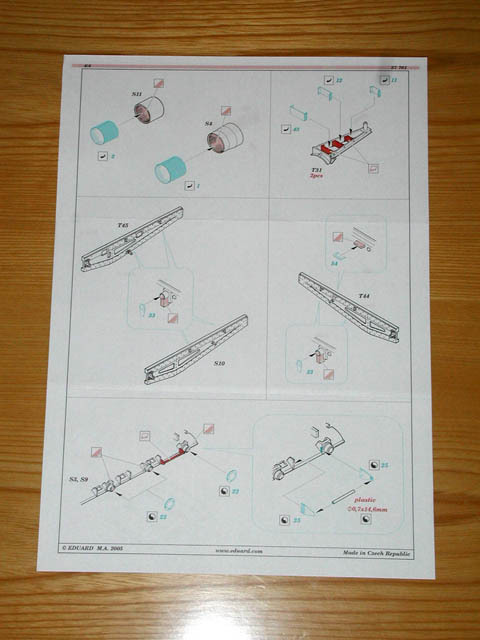 The difference between the two sets is that 35645 includes few strips to fasten long exhaust pipes in the 54 cm gun kit. The rest is exactly the same. 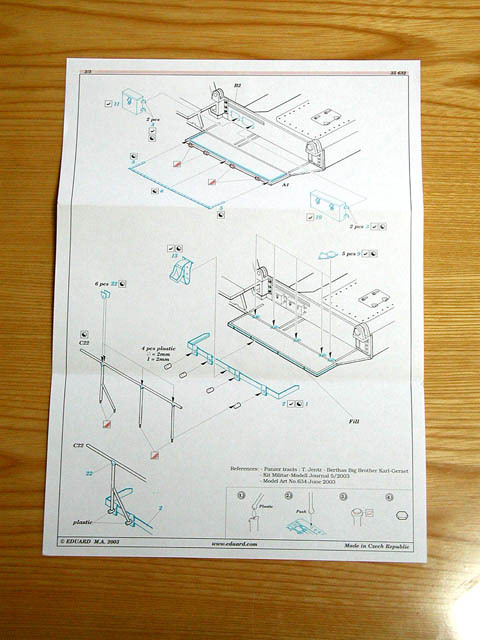 A detail-up sets for foldable railings in the 54 cm gun kit (6181). 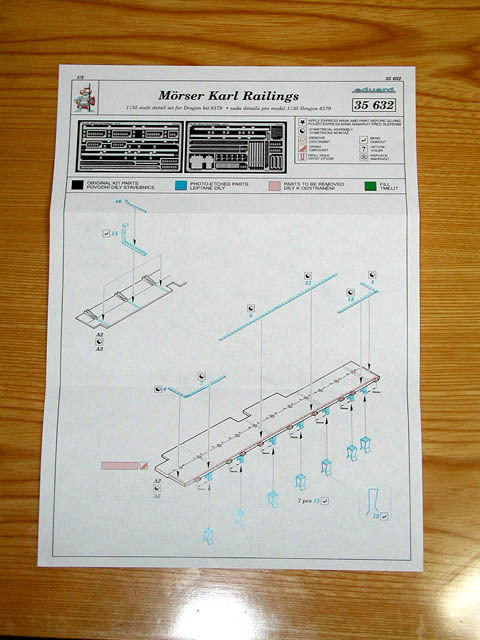 It is exactly the same as "35632 Moerser Karl Railing", while it has a different product number and name. 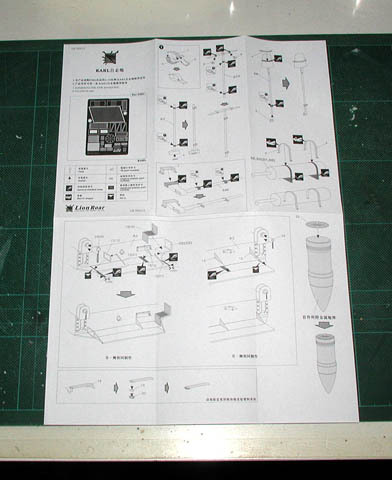 A detail-up sets for foldable floors in the 54 cm gun kit (6181). 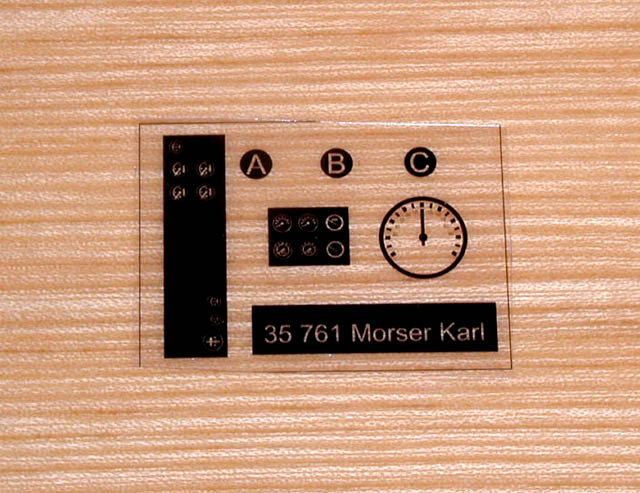 It is exactly the same as "35628 Moerser Karl floor plate", while it has a different product number and name. 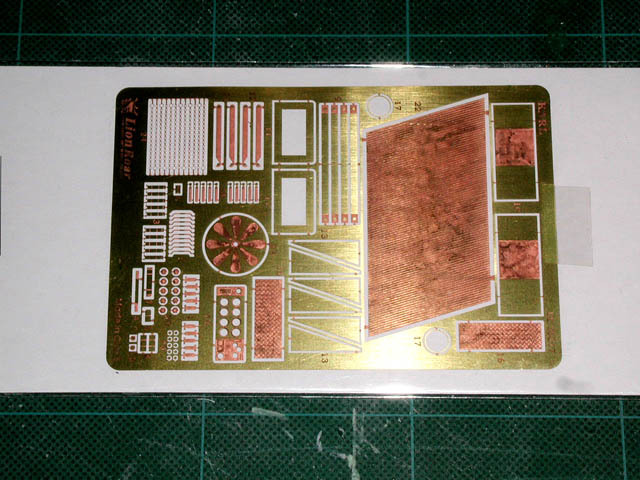 This is the PE set for Trumpeter 1/35 kit. 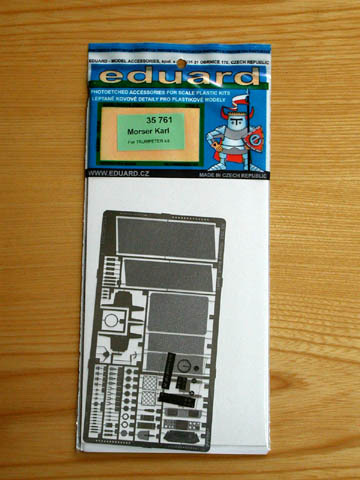 Less than one third of the included parts are common with Eduard's PE sets for Dragon kits, 35568 Moerser Karl 60cm and 35645 Moerser Loki 54 cm, as the Trumpeter kit has its own PE parts and it is quite different from the Dragon's offering. The set consists of tool clamps, rifling thread, chains, and other small parts. 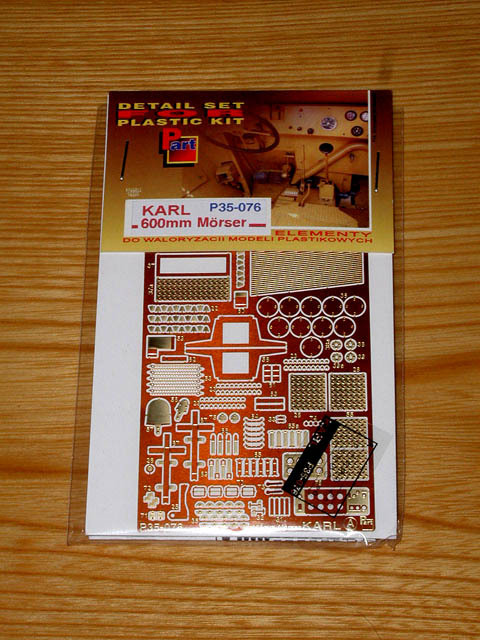 This set adds details to Hasegawa 1/72 Karl kits. 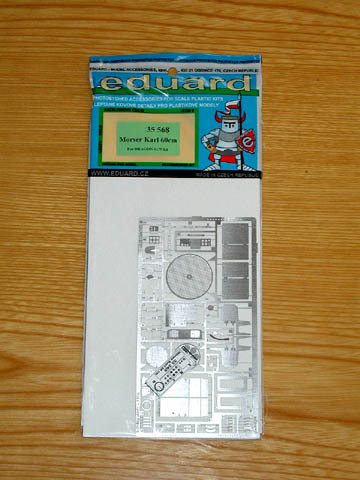 Eduard appears to have used their own PE sets for Dragon 1/35 Karl as a guide, and added some bits specific to Hasegawa's kits. 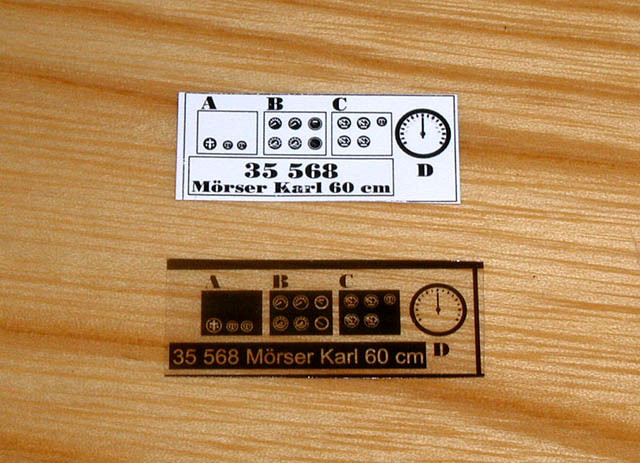 Although this set is intended for Hasegawa's "No.33 Karl with Munitionpanzer IV" kit, it may be used with "No.32 Moerser Karl" (on railway transport cars) if you modify foldable floor parts. Overall impression is good. 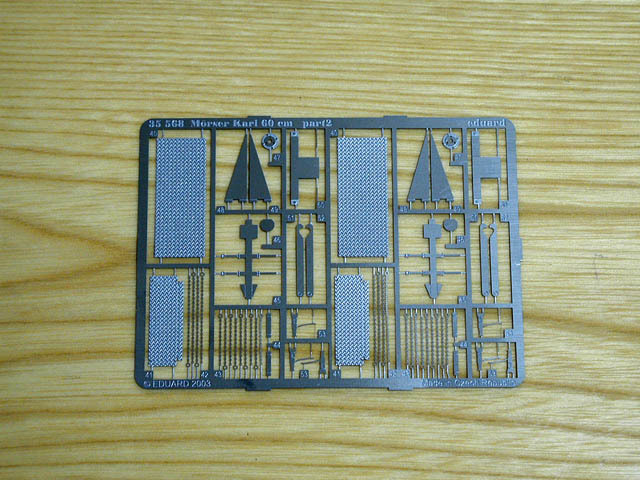 However, it should be noted that this PE set will NOT correct deficiency and mistakes in the Hasegawa's kits; it should be considered that the set will add details to the kits without correcting basic design. 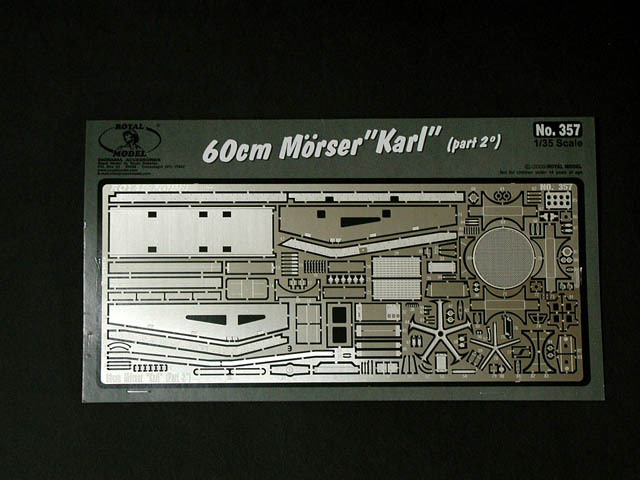 This PE set updates the Munitionpanzer IV for Karl n Hasegawa's kit. 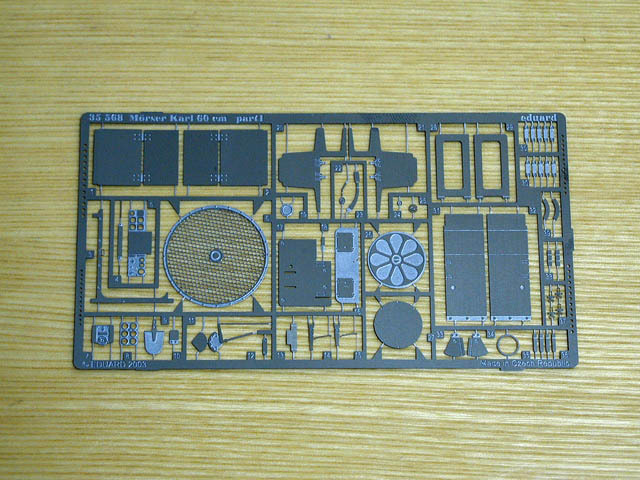 It has quite a number of parts for a small vehicle like the Munitionpanzer IV. It even entirely replaces the rear ammunition compartment walls with PE parts. 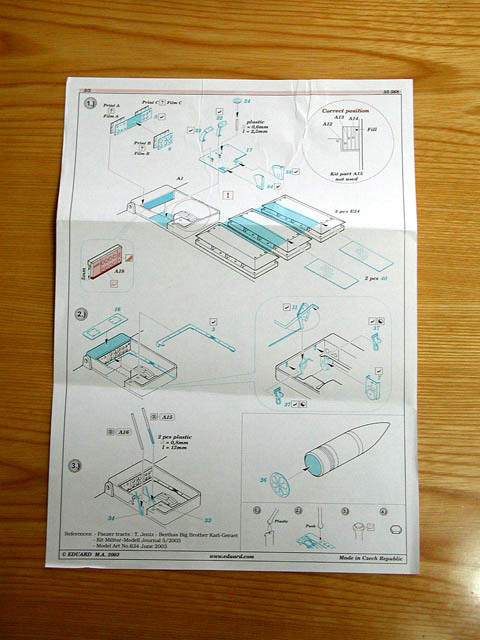 Lids for the ammunition compartment, which are not reproduced in Hasegawa's kit, are also included. 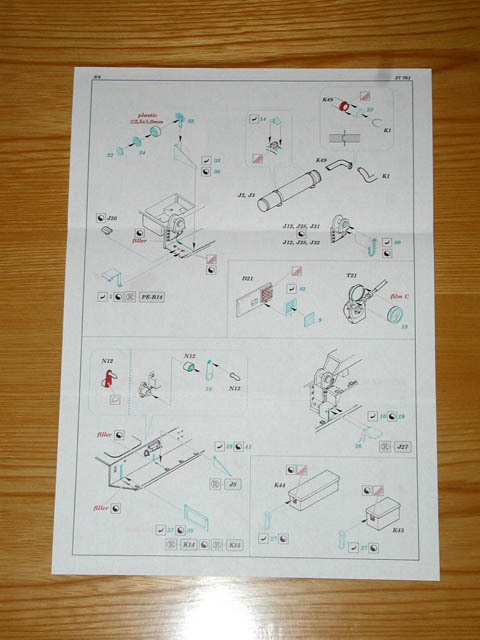 Other parts include fenders, tool clamps. 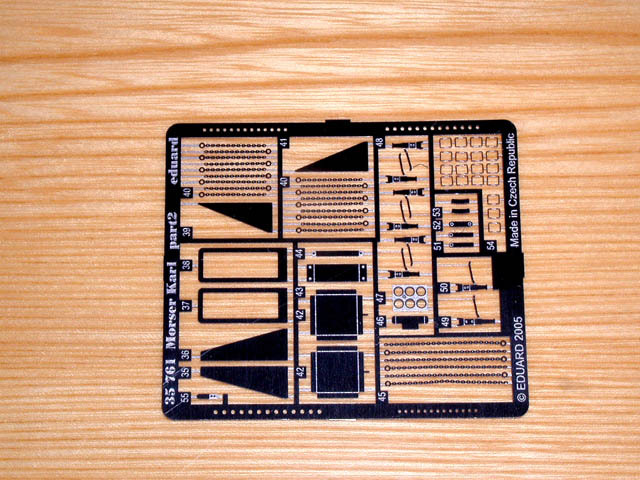 This set basically supplies what was missing in the original kit, and does NOT necessarily correct all the faults in the kit. 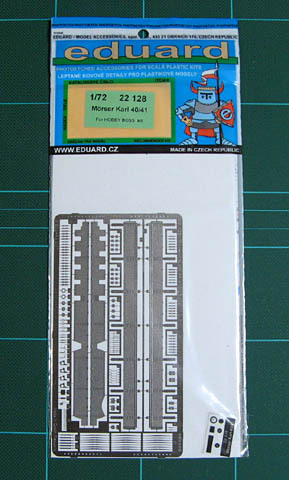 This PE set adds details to railway transport cars in Hasegawa's kit. 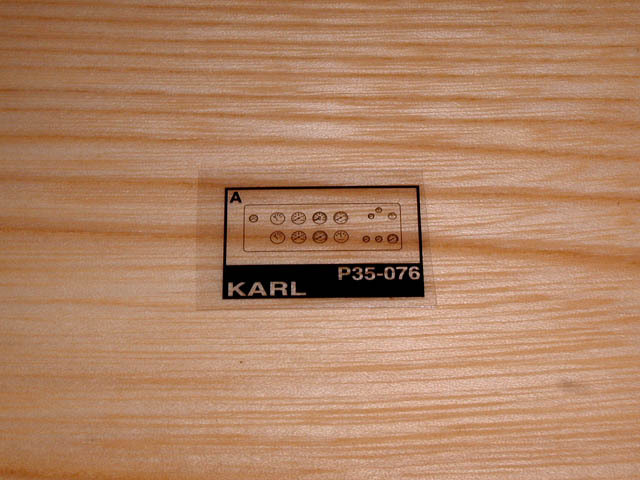 It does NOT have any parts for Karl itself, though its product name may give you impression otherwise. 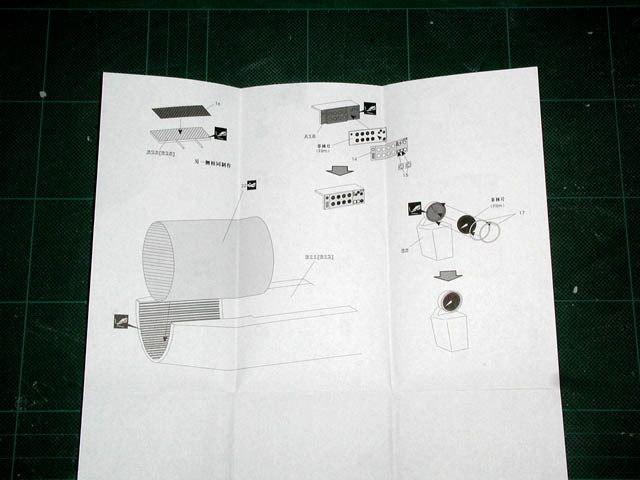 The base of the crane arms, which are somewhat inaccurately represented in Hasegawa's kit, will get considerable number of parts, although the PE parts may look too thin, and may not be able to express "massive" appearance of the crane base sufficiently. 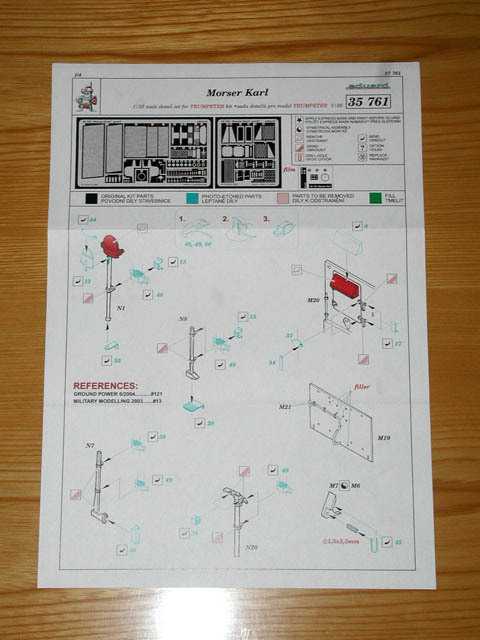 The set can be used with both Hobby Boss #82904 "Moerser Karl-Geraet 040/041 Initial Version", and #82905 "Moerser Karl-Geraet 040/041 Late Version". 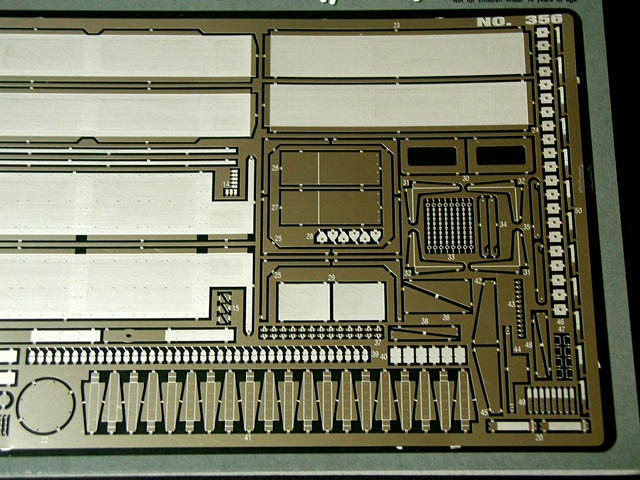 It is very similar to the set #22059 for Hasegawa 1/72 kits. 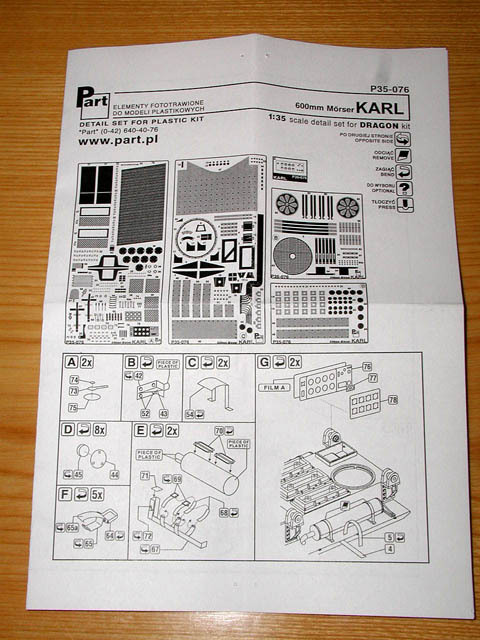 Although it is not explicitly explained in the instruction sheet, you can build "folded" work decks along the superstructure of Karl, out of this PE set. 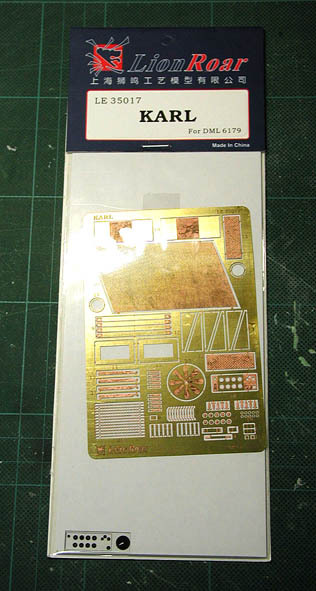 It is useful, as the Hobby Boss kits have these decks molded in the "unfolded" position. 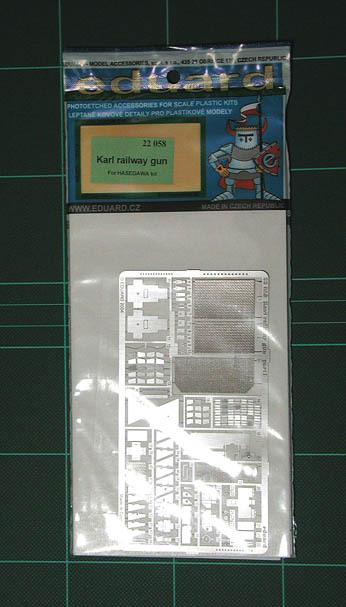 LE35017 WWII German "Karl" LE35017 WWII German "Karl"
This is the first PE set produced for Dragon's 60 cm gun kits (6179). It consists of rifling lines, tool clamps, the driver's instrument panel, chains, fender supports, bottom details for the shell, and others. While there some parts, such as chains, for which there are no corresponding injection parts in Dragon's kits, the main aim of this PE set appears to be replacing inadequate existing injection parts, which are too thick or too simplistic. Lion Roar could have done more to include parts to add details, as there are a number of missing details in Dragon's kits. In addition, the bottom detail for the shell does not look much like the real shell, anti-skit pattern on a small foot step on the side of the cradle is simply wrong, fastening belt of the exhaust pipe has wrong shape as Dragon's kit. All in all, it seems that Lion Roar rushed this set into the market without doing adequate research on the real vehicle. As this set is relatively cheap, you may be opted to purchase. 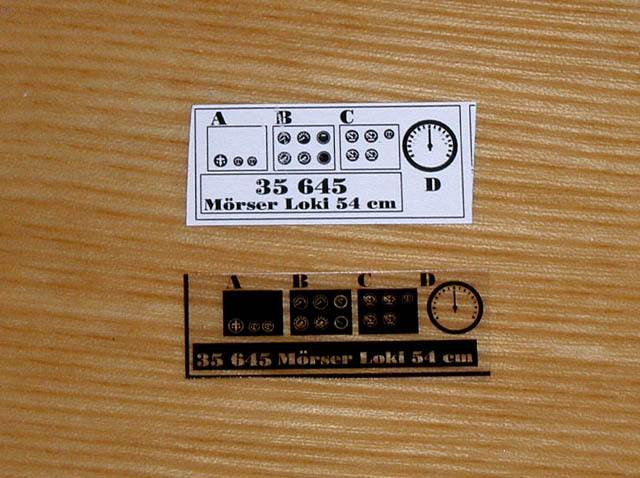 But, you may later want to buy another set from other manufactures to enhance you model. 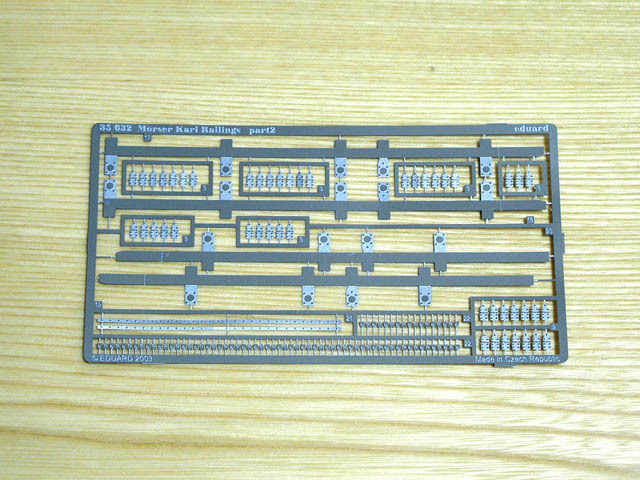 Although this set is intended for Dragon's 60 cm gun kit (6179), it can also be used for the 54 cm gun kit (6181), However, as the kit 6181 already has several PE parts, some parts in this set may be redundant. 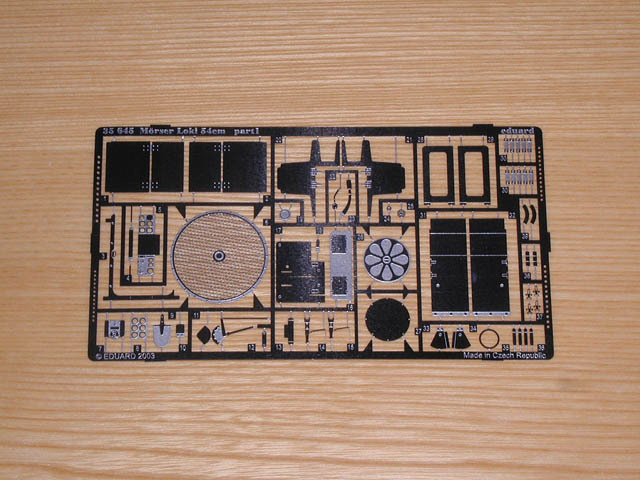 It should also be noted Dragon's newer 60 cm gun kit (6179X) has this PE set already included. This PE set is for Dragon's 60 cm gun kits (6179, 6179X). 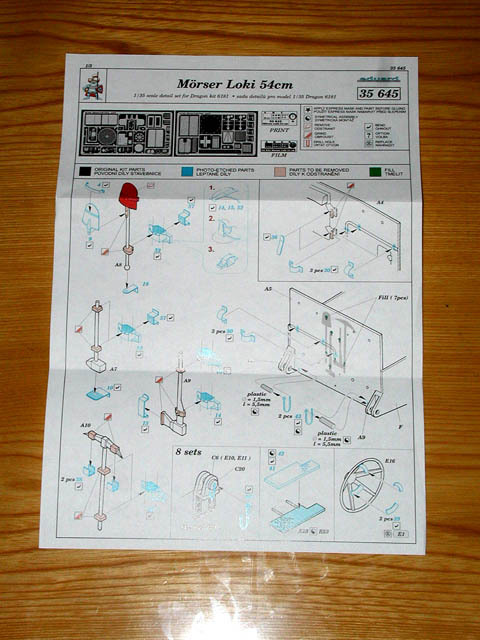 It came out after Lion Roar's product, and is more comprehensive than Lion Roar's. 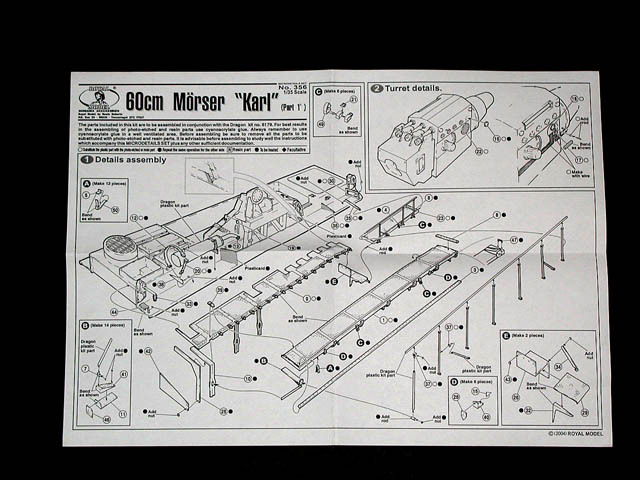 The set includes rifling lines, tool clamps, the driver's instrument panel, chains, fender supports, rivets, bolts, bottom details for the shell, hinges and details for foldable railings, light guard, wiring lines on the gun, and other parts. 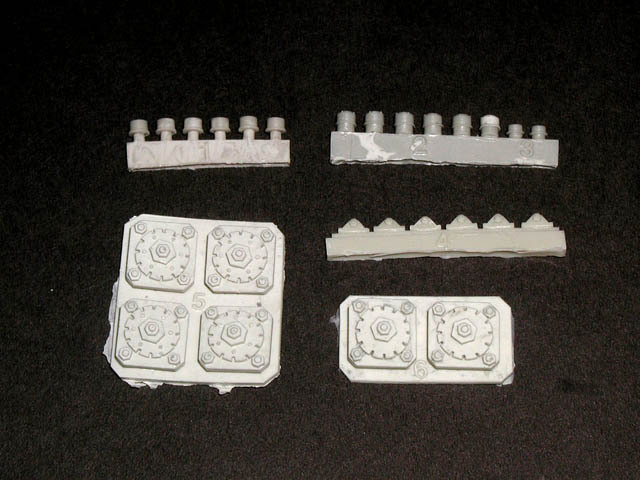 Detail parts for railings are very welcome, as they are one of the weak points in Dragon's kits. 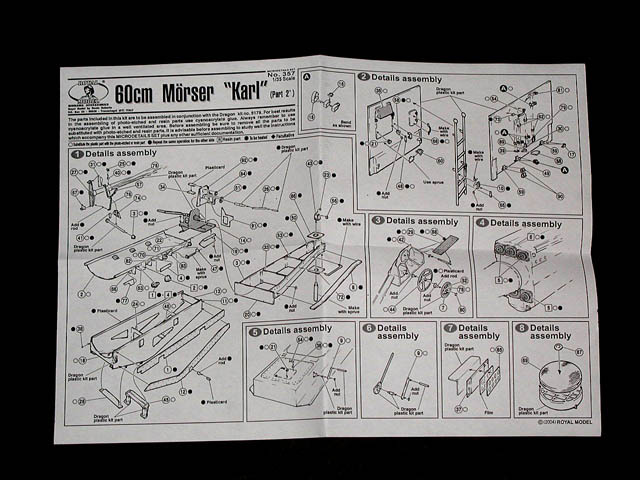 While the real vehicle certainly has even more details than PART's set offers, it does not necessarily mean PART's set is insufficient. Maybe PART's set is just about adequate. In contrast, it is disappointing to see some parts are not quite accurate rendition of real things; PART may have used inaccurate Dragon's parts as template to design them. 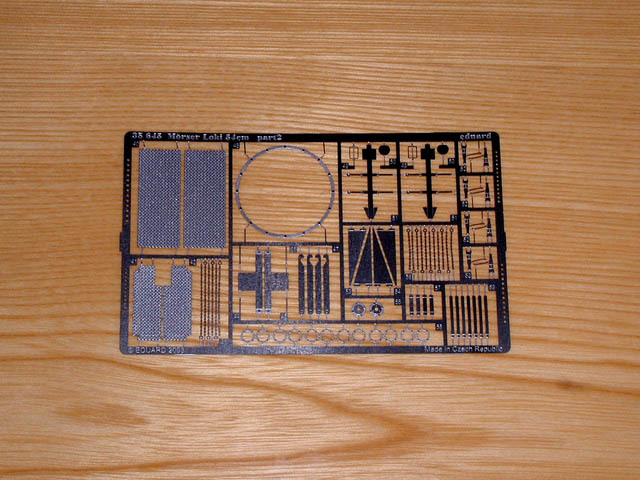 Although this set is intended for Dragon's 60 cm gun kits (6179, 6179X), it can also be used for the 54 cm gun kit (6181), However, as the kit 6181 already has several PE parts, some parts in this set may be redundant. 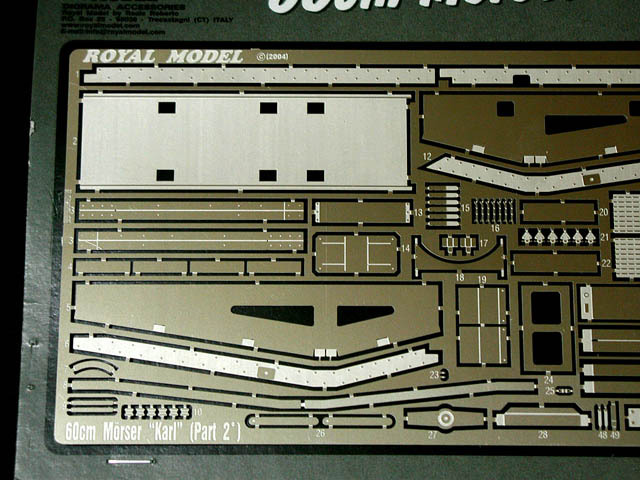 Royal Model is the forth company to provide update sets for Dragon's 1/35 Karl kits, after Lion Roar, Eduard, and Part. 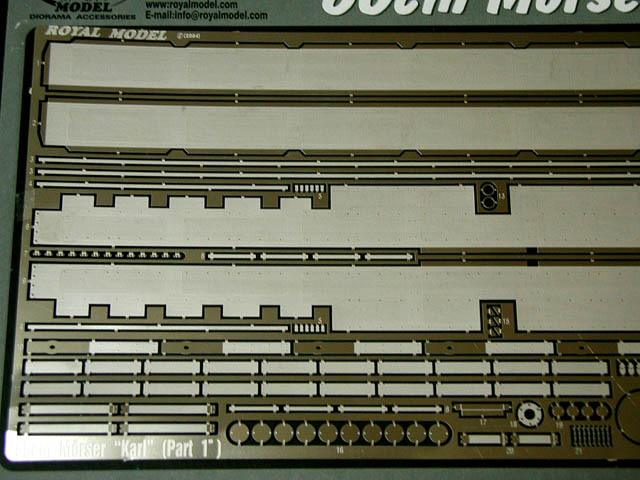 Royal Model's products often includes resin parts as well as PE parts, if thin metal material is not considered suitable. 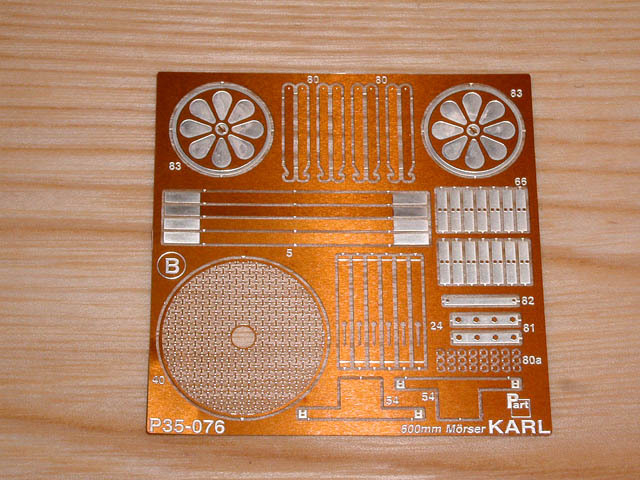 These update sets for Karl are not exception. 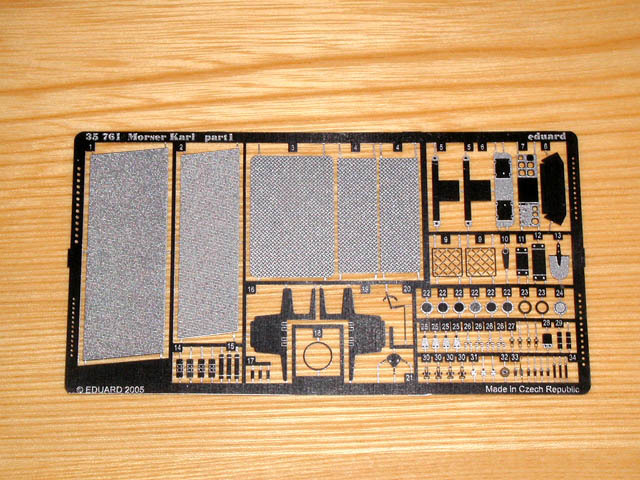 The set 357 consists of 26 resin parts and a sheet of PE parts, while the set 356 has PE parts only. Royal Model appears to have done good amount of research, and it resulted in nicely produced these two update sets. 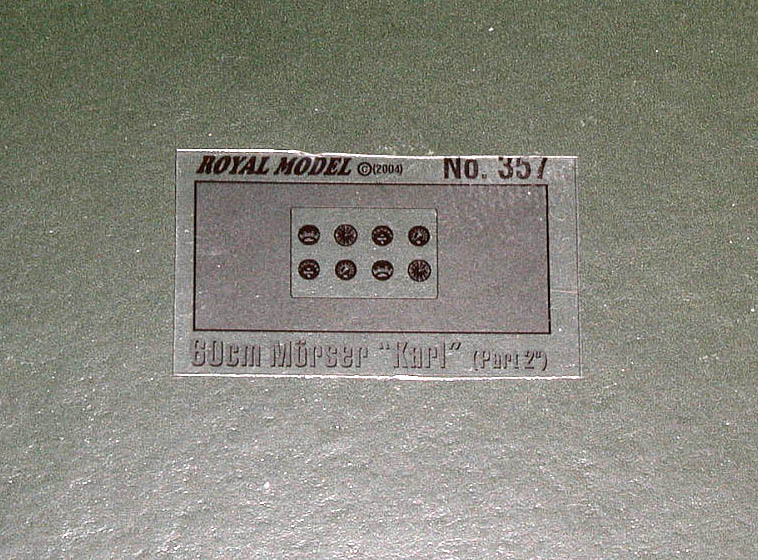 The first set from Royal Model completely replaces foldable floor deck. 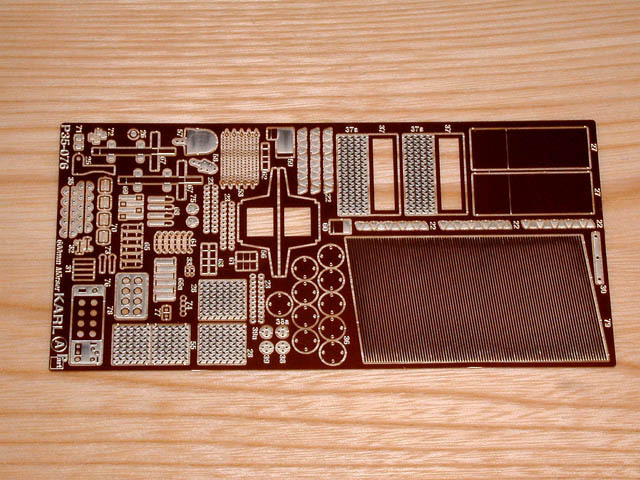 It also includes various small details for rails, exhaust pipes, and the gun cradle. 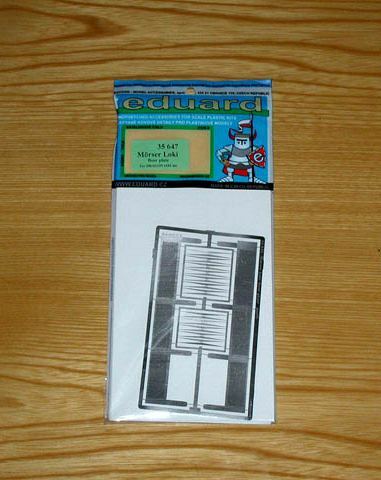 Eduard and PART also have the foldable floor deck parts. 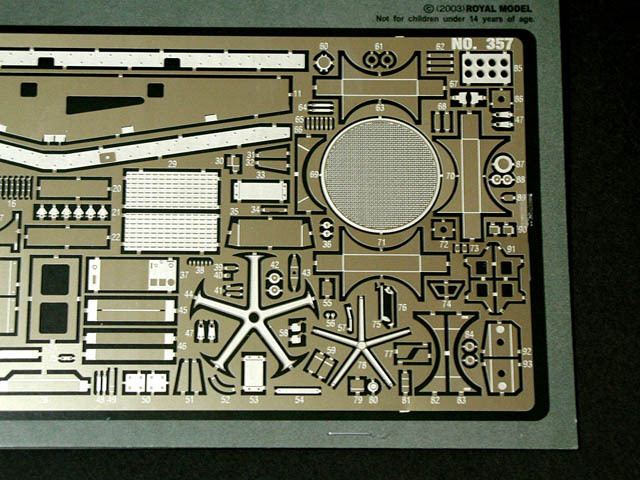 But, Royal Model's parts look most impressive, while it may be most tedious to assemble... 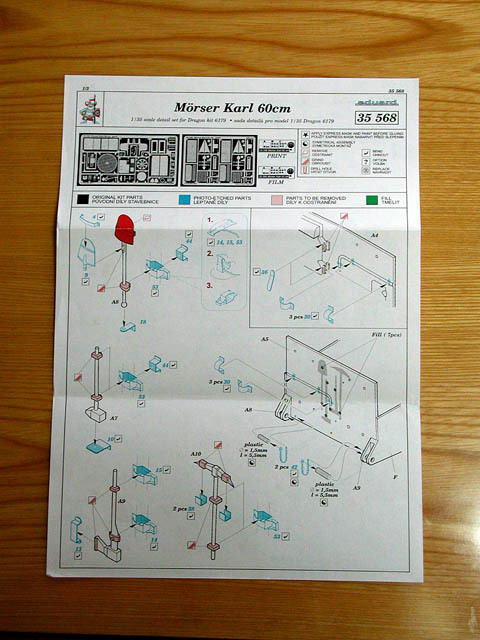 It should also be noted that Royal Model appears to have done homework very well, and its result looks more accurate than other update sets, many of which tend to mimic inaccurate injection parts, without correcting their fault. 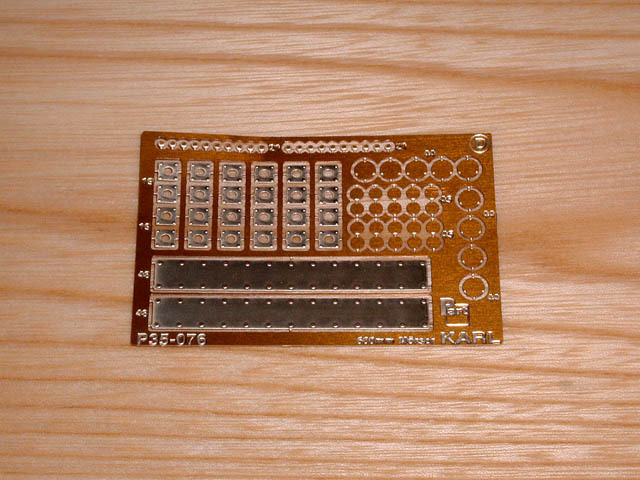 The second set provides the loading tray, tool clamps, driver's instrument panel, grill mesh, hinges, and other small details in PE and resin parts. 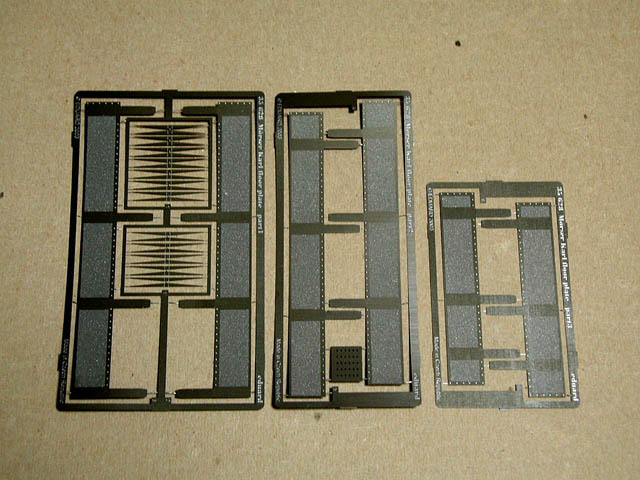 Among these, the loading tray is the highlight of the set. 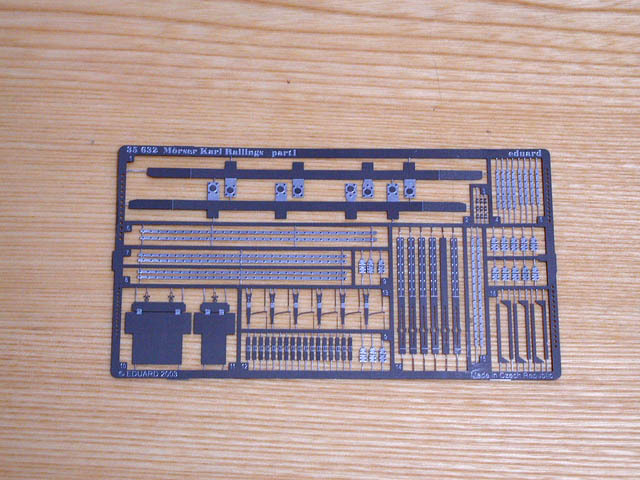 As there are lots to be desired for the loading tray in the Dragon's kits, replacement tray parts can be THE reason to purchase this set. However, its accuracy shouldn't be taken for granted. 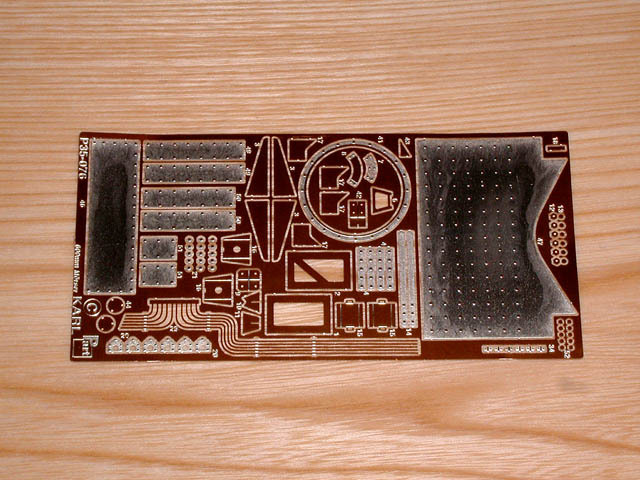 It is possible that Royal Model designed these parts in order just to fit the Dragon's kits. 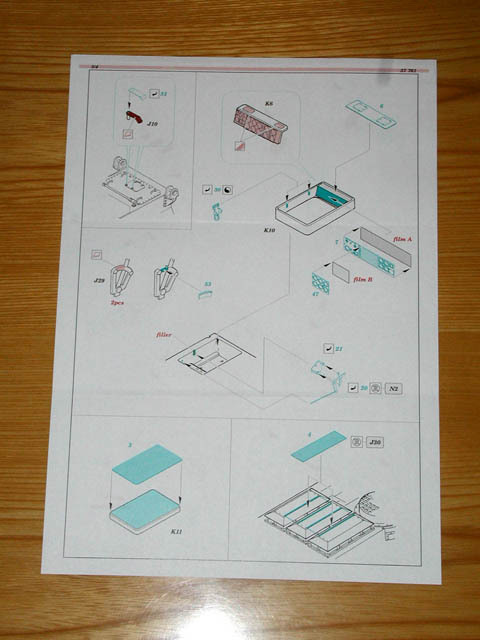 Copyright 2003, 2004, 2005, 2006, 2008 (c) Geraet040, All Rights Reserved.